​I work with stoneware and use the potter's wheel, handbuilding, or a combination of both techniques to achieve the designs I create. With a diversity of form and function, clay types and firing methods, each piece is unique. My focus is in the combination of aesthetic exploration and technical mastery, with special attention to ergonomics. My work is to be used and enjoyed, and hopefully it will bring beauty into peoples lives. As an instructor, I hope to inspire others to love ceramics as much as I do. I often tell a little bit about how I started as a potter to my new students, hoping to find common ground and to give them an incentive. For a long time I thought my story was unique, until I started reading other potters’ biographies. It amazes me how many of us arrive to pottery “accidentally”, which makes me understand the changes one can make in life. As you grow up, you prepare yourself to become something. Many will follow that dream and will stick to it till the end. To switch to something else later in life, was not what I would have foreseen for myself! 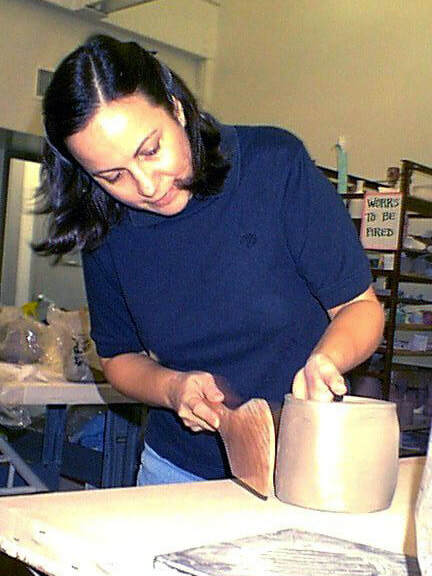 I was 43 when I stumbled in a pottery class at a local community arts center. I was looking for a break from my professional activities as an Industrial Designer and Sales Representative. Pottery was an alternative, since the watercolor class I was looking for was full. Once I touch the clay and the wheel started spinning, I knew I had found myself! I was a potter and didn’t know it!!! What was supposed to be a temporary activity became a life’s passion. Since then, from a beginner student, I became a ceramic’s lab assistant, children’s pottery instructor, adults’ pottery instructor, and studio potter. I started selling my work in small galleries and gift shops, participating in outdoors juried arts festivals and invitational art shows. Looking back I realize how much experience I’ve gained and how my work has improved and changed directions. The more I learn the more there is to be learned and that’s what keeps me going - I love taking the challenges clay offers me! It gives me an un-measurable pleasure to see the successful results coming from the kiln and a learning humble moment when a piece doesn’t make it. In my opinion, the most rewarding experience is when you have your mind and motor skills in such coordination that your hands can create exactly what your thoughts conceived. Clay is the refuge where I find my sanity!